In the autumn of 2007, the Association des victimes de l'amiante du Québec (AVAQ – a Québec association for asbestos victims) and the Ministère du Développement durable, de l'Environnement et des Parcs du Québec (MDDEP – Québec ministry of sustainable development, the environment and parks) published studies on the asbestos concentrations measured in indoor and outdoor air in Thetford Mines. The findings motivated the public health authorities in Chaudière-Appalaches and Estrie to request the assistance of the Institut national de santé publique du Québec (INSPQ – Québec institute of public health) to conduct an assessment of the risk of lung cancer and mesothelioma of the pleura in this population. Asbestos is divided into two families: amphiboles (crocidolite, amosite, tremolite, actinolite and anthophyllite) and serpentines (chrysotile). The three main diseases associated asbestos exposure are asbestosis, lung cancer and mesothelioma of the pleura and peritoneum. The risk of mesothelioma of the pleura attributable to exposure to amphiboles is higher than the risk attributable to chrysotile. In addition, mesothelioma could be caused by low and sporadic exposures to asbestos, and asbestosis is unlikely to occur among individuals exposed non-occupationally to asbestos concentrations generally present in the environment. That is why only the risk associated with the two cancers was considered. Two approaches were used to conduct the carcinogenic risk assessment in Thetford Mines. The first approach is derived from the methodology proposed in the Lignes directrices pour la réalisation des évaluations du risque toxicologique pour la santé humaine (guidelines for conducting assessments of toxicological risk to human health) of the Ministère de la Santé et des Services sociaux du Québec (MSSS). This method is based on the assumption that the risk is the same for exposure to amphiboles or to chrysotile. The second approach is derived from the recent model by Berman and Crump. In this model, the risk associated with amphiboles differs from that associated with chrysotile. The two procedures take into account the average lifetime exposure dose (sum of the average exposure dose by inhalation of indoor air and the average exposure dose by inhalation of outdoor air) and a cancer potency factor specific to asbestos. The exposure dose for indoor air was calculated using concentrations reported in the AVAQ study. In 2003 and 2004, the authors of that study evaluated asbestos concentrations in indoor air in 26 residences in the city of Thetford Mines. Most of the asbestos fibres detected were chrysotile fibres, but actinolite and tremolite were also detected. As prescribed by the MSSS, the upper limit (UL) of the 95% confidence interval (95% CI) of the arithmetic mean of the concentrations measured was utilized to assess exposure. It is 0.0031 fibre/ml (f/ml). For outdoor air, the results of the 2004 MDDEP study of ambient air in the city of Thetford Mines were used. Chrysotile and amosite fibres were detected in the samples. The UL of the 95% CI is 0.0035 f/ml. Based on these two series of data, the average lifetime exposure dose is 0.0031 f/ml. With this dose, according to the methodology of the guidelines, the lifetime excess mortality from lung cancer and from mesothelioma is between 72 and 125 per 100,000 persons in Thetford Mines continuously exposed to asbestos during their lifetime. The lifetime excess mortality from these same cancers, estimated using the Berman and Crump model, is 8.2 per 100,000 persons with a continuous lifetime exposure to chrysotile fibres. For comparative purposes, the risks associated with asbestos fibre concentrations generally found in the environment were calculated. They vary from 0.46 to 7.1 per 100,000 persons depending on the approach utilized (Berman and Crump model or MSSS guidelines). The average asbestos fibres concentration measured in the indoor air of residences in the city of Thetford Mines is 1.7 times lower than that found in 17 schools in Québec, and 1.4 times lower than that measured in two residences affected by dust created by the collapse of the World Trade Center (WTC) towers a few days after the events of September 11, 2001. However, the average asbestos structures concentration in Thetford Mines is 232 times higher than the background level measured in apartments in New York City. Lastly, the average asbestos concentration (structures or fibres) in the houses in Thetford Mines is 4 to 46 times higher than the average concentrations found in the United States in residences and public buildings having asbestos containing materials (ACM). The average concentration of asbestos fibres measured by the MDDEP in outdoor air in the city of Thetford Mines has remained stable since 1997. However, it is 215 times higher than that measured in samples taken across the United States and 7 times higher than the detection limit of the analytical method utilized to measure asbestos concentrations in urban areas in Québec and areas close to an inactive tailings site in Tring-Jonction in 2004. Finally, of the four indoor air quality criteria listed, only the WTC criterion was retained (0.0009 PCMe asbestos fibre /ml), because it is the only one that took health effects into account. Nineteen percent of the indoor air samples in the AVAQ study exceeded this criterion. When more than 10% of samples exceed the selected criterion, it is considered that a health impact could have occurred or could occur. None of the outdoor air quality criteria were retained. The results of the risk assessments must be interpreted with caution since they include uncertainties related to, for example, 1) the determination of the lifetime unit risks, which are developed from dose-response relationship models derived from epidemiological studies conducted among workers; 2) the statistical models utilized to extrapolate the results obtained from cohorts of workers to a population exposed to low doses in the environment; and 3) the concentrations employed to determine the average lifetime exposure dose based on the AVAQ and MDDEP studies. These uncertainties could have led to an overestimation or underestimation of the risks calculated, which it is difficult to quantify. Notwithstanding the uncertainties and the limitations cited above, the results of the risk assessment and the comparative analysis of the asbestos concentrations measured in Thetford Mines suggest a health risk attributable to the presence of airborne asbestos in this region. The risk levels estimated in this study can only be extrapolated to the entire population of Thetford Mines insofar as the concentrations from these two data sources are representative of the concentrations to which the entire population of the city is exposed. It would be appropriate to test the risk estimated by the two approaches against recent epidemiological data on lung cancer and mesothelioma of the pleura in Thetford Mines in order to identify whether there is an overestimation or underestimation of the risk, even though the epidemiological data from the 2000s derives from exposure that took place between the 1960s and the 1980s approximately. In conclusion, it is important to emphasize that, according to the WHO, there is no evidence of a safe threshold for the carcinogenic effects of asbestos, and an increased cancer risk has been observed in populations exposed to very low concentrations of asbestos. In light of this, it is desirable to reduce exposure as much as possible. Consequently, certain control measures must be contemplated such as prohibiting access to mine tailings sites or halting the use of mine tailings for backfill and for abrasive or other purposes. As well, it would be appropriate to take new measurements of asbestos in the air in Thetford Mines in order to monitor exposure over time, to ensure that it does not increase. 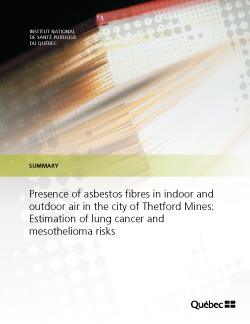 The complete report is also available: Presence of asbestos fibres in indoor and outdoor air in the city of Thetford Mines: estimation of lung cancer and mesothelioma risks.